Once upon a time there was a lady who really loved the color orange. She had an orange car, orange bed spread, orange cat, orange everything. The one thing she wanted that wasn't orange was her hair. She just wasn't sure if coloring her beautiful locks was worth damaging her long locks. She shopped for a hair stylist in her area for about two weeks. She finally decided to shop online for a wig instead. She was in luck when she found the Neon Orange Long Wig! 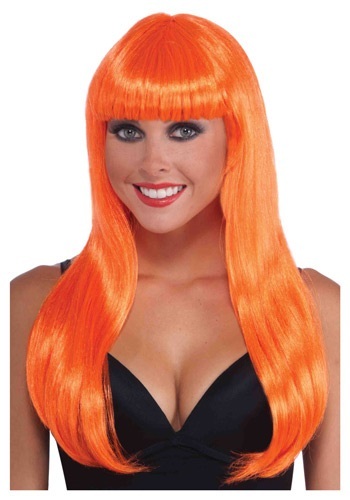 You can be just like her in the Neon Orange Long Wig. It's perfect for any clown costume or silly costume you can think of. Or, if you love orange, just for a cool look. The fitted hair net inside the wig helps it stay in place.